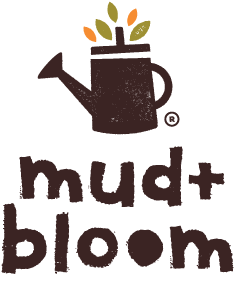 Mud & Bloom inspires children to connect with the outdoors through a monthly and seasonal nature crafts and gardening activity box. The boxes are designed for 3-8 year olds and each includes at least two seasonal activities – one gardening and one nature craft – along with instructions, quizzes and games aimed at teaching children about the seasons, plants and animals. We believe that if children are connected to nature from a young age they will have a stronger environmental ethic as adults and are more likely to protect nature later in the life. We aim to foster a child’s curiosity and love for nature from a young age regardless of where they live. The process of planting, growing and harvesting vegetables and herbs can be done on windowsills and in small spaces, and we believe the act of nurturing plants has multiple benefits for a child’s wellbeing. Nature can also be found in urban spaces and we believe it’s important for children to be shown and to touch and feel and be curious about things that can be found in nature. Mud & Bloom aims to use as little plastic as possible in our activities and packaging. We also only provide organic peat free compost pellets and organic vegetable and herb seeds.